In the last few months I have reviewed no fewer than eight different Rossini operas. These include all five one act farse on the Brilliant Classics label, La pietra del paragone and Il Signor Bruschino on Naxos and the ever popular Il Barbiere di Siviglia on Guild. You might think that hardly surprising from a composer with thirty-nine operas to his credit. However, except for Barbiere the others were among Rossini�s first ten operas, the last six having been premiered in the space of less than fifteen months. Looking at the first twenty years of LPs there were never more than eight of his operas featured in the catalogue. Apart from Barbiere, of which there was always two or three recordings, titles which featured were L�Italiana and La Cenerentola, both with Teresa Berganza, and Il Turco in Italia with Callas. The explosion in recordings came about from the mid-1970s onwards and owed much to the establishment of the Rossini Foundation at Pesaro, the composer�s birthplace, and the annual festival held there. At the Festival, well-researched critical editions of Rossini�s works were performed, some for the first time in the century. The Festival drew the best Rossini singers and performances were often recorded for commercial issues particularly by the CBS label. The year 1975 also saw the first of a Philips series of recordings of Rossini operas many of which were previously only names in books of reference. 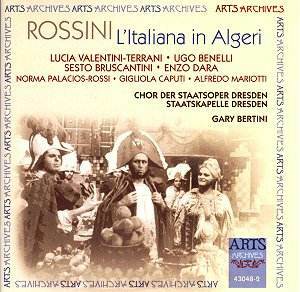 L�Italiana in Algeri, number eleven in the Rossini operatic oeuvre, has been a major beneficiary on record from the Rossini revival to the extent that Lucia Valentini-Terrani has recorded Isabella, the eponymous L�Italiana, twice. Her other version, on CBS/Sony is with period instruments. Other recordings feature Marilyn Horne (Erato, 1981), Agnes Baltsa (DG, 1987) and most recently Jennifer Larmore (Teldec). A veritable plethora of choice. The present 1978 recording has the benefit of the sympathetic and idiomatic conducting of Gary Bertini. He generally keeps a good pace and maintains the brio and vitality that are the hallmarks of the composition. Using the lightly orchestrated critical edition helps. In the libretto Isabella has been sailing in the Mediterranean in search of her lover Lindoro. She is accompanied by an elderly admirer Taddeo. After her ship is wrecked Mustafa, the Bey of Algiers, plans to add her to his harem. Just to add amusing complications, Isabella finds that Lindoro is a slave in Mustafa�s service and he plans to marry him to Elvira, his neglected wife. Needless to say all ends well in a rousing finale (CD 2 Tr. 17). Isabella�s music requires her to express both tenderness and determination. Lucia Valentini-Terrani uses the extremes of her very wide range for these purposes, lightening her tone (CD 2 tr. 7) or dropping into her formidably strong chest register in Cruda Sorte (CD 1 tr. 7). The only problem I have with her interpretation is that the movement between the two extremes can be a little too much like a gear change. Marilyn Horne is similar in this respect whilst the tangy Baltsa, and particularly Larmore are smoother. What the others lack is Lucia Valentini-Terrani�s way with the nuances and languor of her native Italian. A horn solo introduces the unhappy Lindoro. His andantino Langir per una bella (CD 1 tr. 4) is followed by a duet with the Bey. As Lindoro, Ugo Benelli the epitome of the tenore di grazia has enough metal in his agile heady tones to make his singing and interpretation among the best on record. He has a lovely mezza voce allied to gentle expressive phrasing. In the duet with Mustafa his patter is well articulated (CD 1 tr. 6). The veteran Sesto Bruscantini sings the role of Mustafa. With over 130 roles in his repertoire in a long career it would be foolish to suggest his voice is in prime condition. Although he originally sang as a bass, at Gigli�s suggestion he raised to baritone. Most of his career until the 1970s was spent singing the buffa roles. He lacks the tonal sonority of Ramey (Erato) or Raimondi (DG), but despite a slightly throaty tone he understands everything about the role and the words come over with relish and meaning. Enzo Dara sings Taddeo. He takes the role in three of the recordings referred to, including this one; a monopoly not often matched let alone exceeded. The character oozes from his pores, or at least his vocal chords (CD 1 tr.9). The Elvira of Norma Palacios-Rossi doesn�t match Kathleen Battle (Erato) but like the singers taking the other lesser parts she doesn�t let the side down. Of note is the singing of Alfredo Mariotti as Haly with a smoothly controlled and sonorous big voice (CD 2 tr. 11). The recording is a strange mixture. It is warm and well balanced between soloists and orchestra with no constriction on the sound. However, there is an additional excessive bloom to the voices that puts them apart, giving falseness to the overall acoustic impression. The booklet has essays on Rossini Anecdotes, the opera itself and a synopsis, all in English, German and French. The libretto is given in full without translation. Issued at the bargain end of the market this recording is highly competitive with the mid-price Erato. The earlier Decca version with Berganza is not currently available. The two lovers here are a captivating pair in what is one of Rossini�s most light and exuberant scores. Its modest price is an added incentive to add this version to any others you might own. If you don�t know the opera then I urge you to go and buy this now and remedy that deficiency. Not for nothing did L�Italiana in Algeri launch Rossini on an unstoppable international career that saw him become, in his lifetime, the most prestigious opera composer of his time. The CD era has coincided with his emergence to his rightful place in the pantheon and it is now possible to buy recordings of all but a handful of his operas.